We all know that unstructured time in nature is vital for kids and spending time in the backyard is one of the easiest ways to do that. 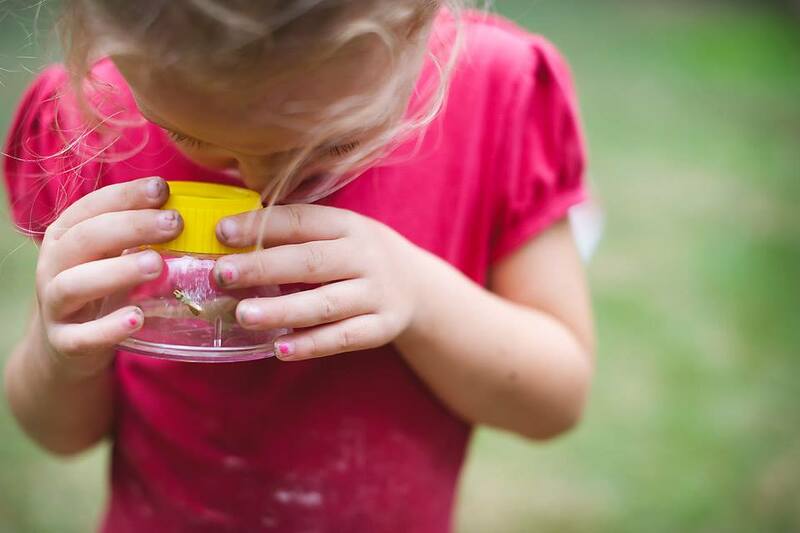 But what resources can you have on hand to get the most out of backyard exploration? 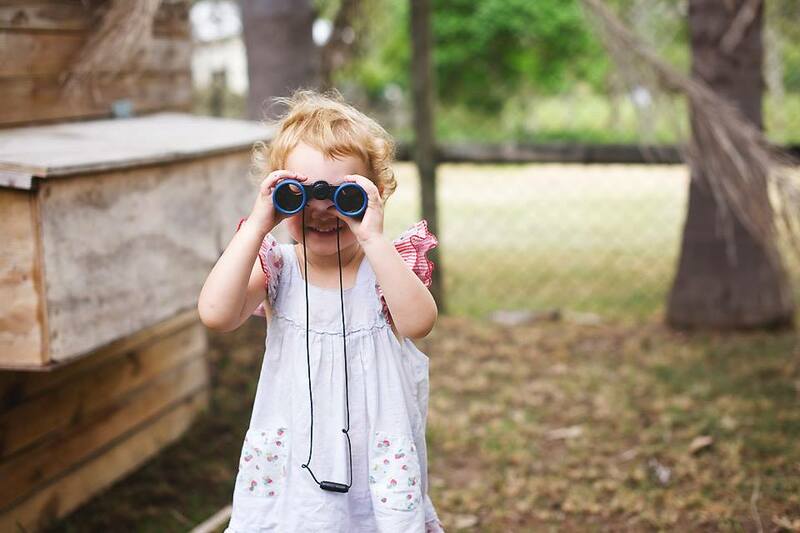 Binoculars are a must have for nature exploration. The one’s we have come with a safety neck strap, lint-free cloths and a carrying pouch. These 4 x 32mm binoculars feature coated glass lenses and a die-cast body with rubber cover and are exactly the right size for small hands. 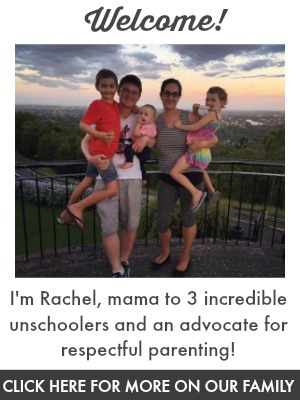 There are similar here for those outside Australia. Through these we’ve identified many birds and watched local kangaroos from afar. Without binoculars we wouldn’t have known what a kookaburra had caught to kill and eat high in a tree or spotted the noisy nest next door hiding amongst the branches. 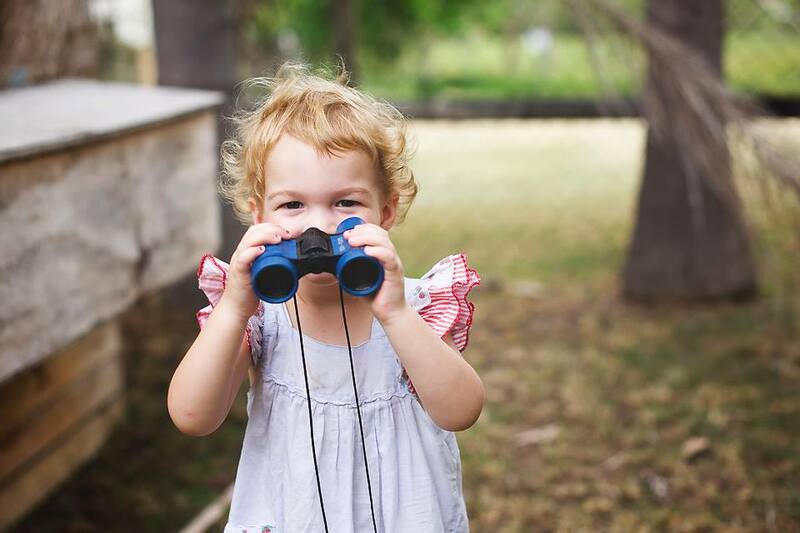 Binoculars open up a world of exploration beyond the yard and high above our heads! 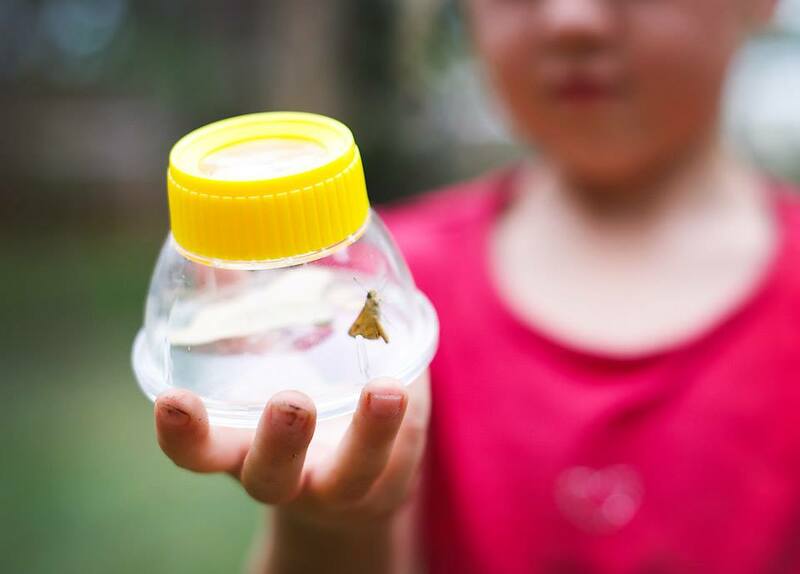 High quality bug viewers are a must for any nature exploration. I love the size and shape of these one’s and the kids really enjoy the magnification and the fact that these jumbo specimen viewers have a 7.6 cm wide bottom with a built-in ruler to easily measure the specimen! It’s great for early numeracy and classification. The viewers come with little air holes so any specimen can be kept in the viewers safely. The lid is also secure so that the creatures won’t escape. I found similar here for those outside Australia. They aren’t limited to insects though – we love these for having a closer look at almost anything around the yard. Even indoors they are kept around to easily take a closer look at interesting things. Garden tools are not just for gardening! I can’t tell you how much we love this set of tools for play and exploration. 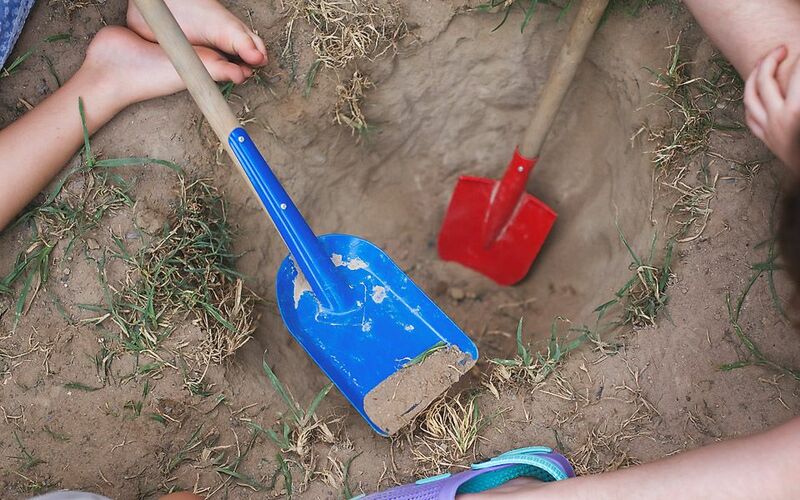 This spade, shovels and rake have been used for everything from playing in the sand pit to digging up worms in a Mum-approved spot. They’re the perfect size for kids and are real tools that are strong and high quality – no flimsy plastic pretend version! Here are similar on Amazon. Cameron inadvertently dug a trap hole for a baby toad (above) which lead to lots of questions and research and learning. These tools open up a new world of exploration on and under ground! By far my favourite tool is a handheld microscope (at the moment these are an incredible 50% off – making them a tiny $9.99!). This takes magnification to another level in an accessible and portable way. Here are similar for those of you outside Australia. This handheld microscope has a magnification of 20x and 40x and comes with an LED light to light up the objects for a clearer view (batteries included). I cannot believe the quality and magnification of this pocket sized microscope. It’s sturdy and easy to use for small hands. 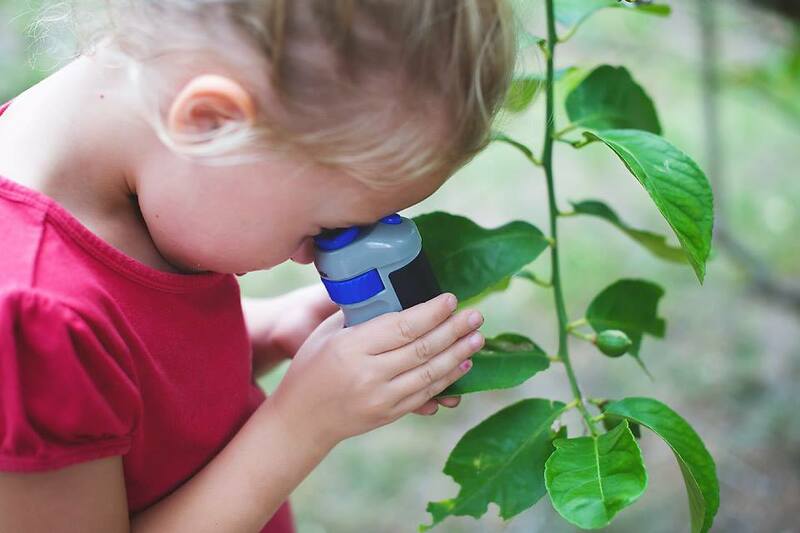 We use it to look at plants up close, insect eggs, unidentifiable tiny objects and all kinds of little critters. It’s perfect for the backyard as well as taking on nature trips. It really changes how children view the world around them! 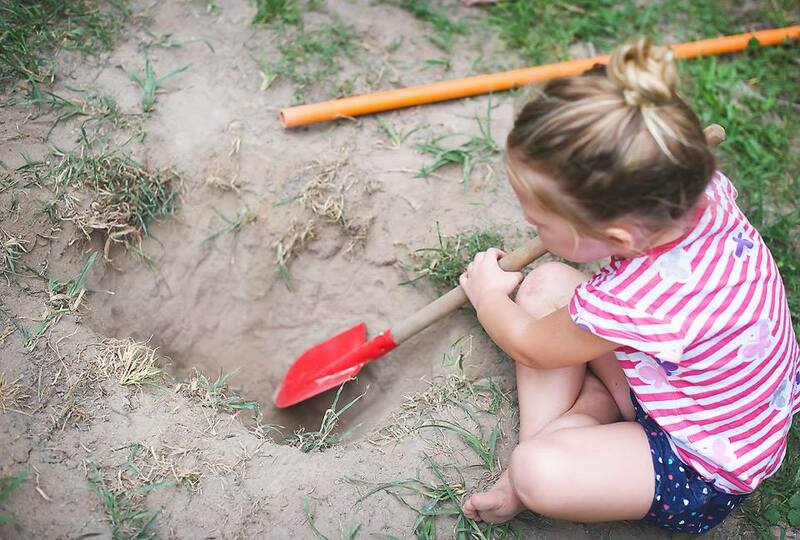 There you have it – my top tools for backyard exploration! What would you add? Real Tools | Day 16 – 30DaysTYP Learn and Play Using Real Tools with Kids Ultimate List of Homeschool Co-op Ideas Sensory Nature Scavenger Hunt | Free Printable! i love the handheld microscope!! And what a bargain right now! Great recommendations! I’d also recommend a nature guide, to look up names and basic information on the plants and animals you find. We also have a nature journal, where my daughter draws pictures of anything that’s interested her during our walks. I really like the look of the handheld microscope too.